This African safari lodge in Botswana is located on the edge of the Okavango Delta in a 8 000 hectare exclusive wildlife concession that borders the Moremi Game Reserve. 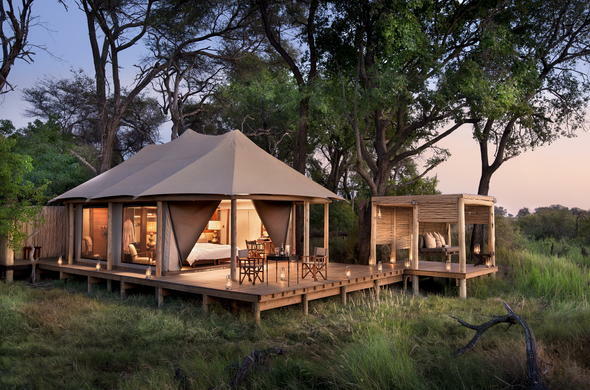 This safari camp in Botswana is situated near the channels of the Delta, invites guests to a unique wilderness experience and excellent game viewing opportunities. This African safari lodge in Botswana is located on the edge of the Okavango Delta in a 8 000 hectare exclusive wildlife concession that borders the Moremi Game Reserve. The camp has a beautiful elevated main building made from local timber, reed and thatch and overlooks the majestic floodplains. The main building houses a dining room, lounge and expansive deck, where guests can relax and enjoy the sights and sounds of Botswana on their African safari holiday. There is also an outside dining and campfire area, swimming pool, curio shop and interpretive centre at this African safari lodge in Botswana. Activities at this safari lodge in Botswana include guided bush walks, guided mokoro (dugout canoe) excursions and unforgettable night game drives. This Africa lodge in Botswana serves the most delicious Pan-African cuisine to tantalize your taste buds. Children of all ages are welcome at this safari lodge in Botswana. Children under the age of 5 cannot participate in game drives. Children aged between 6 to 11 years are accommodated on game drives at the lodge manager's discretion. An extra bed can be arranged for a child sharing its parent's tent and child minders can be arranged at an additional charge.